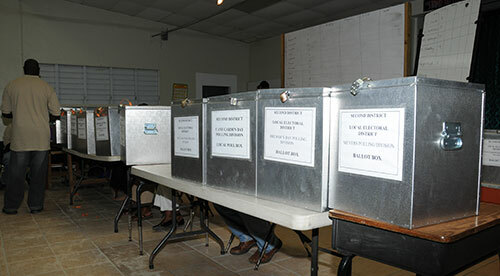 Thursday, September 11 – Supervisor of Elections, Mrs Juliette Penn is informing the public that in accordance with Section 18 (5) of the Elections Act, 1994 and Amendments, the Preliminary Voters’ List for 2014 is available for inspection for a period of ten days from September 12-22, 2014.
at such places as the Governor may direct in the local electoral district to which the list applies and at the Elections Office, the General Post Office and all the Branch Post Offices and Sub-Post Offices throughout the Territory. Every person who claims that his/her name, address or occupation has been wrongfully stated or omitted from the Preliminary List shall give notice to the Supervision in Form No. 3 within 10 days after the publication of the said list. Every person whose name appears in any Preliminary List may object to any other person whose name also appears therein as not being entitled to have his/her name therein, shall give notice to the Supervisor of Elections in Form No. 4 within 10 days after the publication of such list. All claims or objections must be filed at the Elections Office. Forms are available at the Office. For further information please contact the Office of the Supervisor of Elections at telephone 468-4380 or 468-3701 extension 4380 between the hours of 8:30am and 4:30pm. The office is located on the ground floor of the Ulric Dawson Building, No. 6, Russell Hill Road, Road Town, Tortola.